The Source Water Collaborative Learning Exchange is a platform for discussing current challenges, sharing stories, and transferring knowledge on source water protection (SWP). Showcasing efforts to support agricultural producers through the USDA’s RCPP (Regional Conservation Partnership Program). Review the Middle Cedar Partnership Project's pre-proposal, the first step in the RCPP application process. The Middle Cedar Partnership Project was selected to submit a full proposal with more extensive requirements. 16 organizations leverage $2 million in RCPP funding to protect the source of drinking water for Cedar Rapids, Iowa. Watch American Water Works Association's (AWWA) video describing how partnerships between the water and agricultural communities are vital to source water protection and how Congress can help address the issue. Click on the map image below to explore RCPP projects from across the country that are helping protect and improve source water quality as well as combat drought, enhance soil health, support wildlife habitat, and protect agricultural viability. Project descriptions and information were obtained from the Regional Conservation Partnership Program website. This webinar will provide recommendations on how to improve planning for emergency preparedness and response. Early warning monitoring system that notifies decision makers to ensure faster implementation of actions. Resources from our diverse member network to help your utility & community prepare & respond to a drinking water event. A methodology from the Water Research Foundation on identifying, visualizing and analyzing potential contamination sources upstream of drinking water intakes. Can be used during source water contamination events to determine potential human health concern & help prioritize response efforts. PA & neighboring states' development of early warning systems among community water systems, and other partners. Featuring Lynn Thorp with Clean Water Action, Steve Via with AWWA. and Jim Capurso, with the U.S. Forest Service. Download the SWC's top tips and links to helpful resources. Help promote this month's Learning Exchange by tweeting about our activities and resources. SWC member, Trust for Public Land, helped forge the Green Schoolyard Initiative in Philadelphia, PA. This city-wide partnership is working to transform asphalt schoolyards and underutilized recreation centers into playgrounds and parks that limit harmful runoff to drinking water sources and provide green, vibrant places the whole city can enjoy. 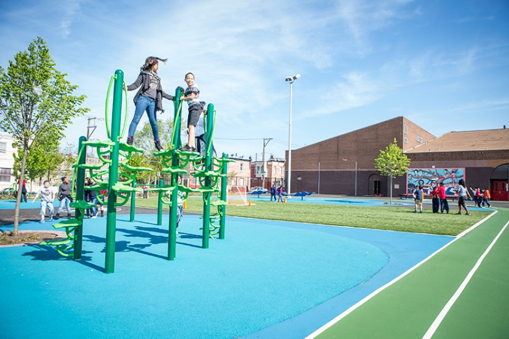 Learn more about the Trust for Public Land’s creative approach and unique collaboration with Philadelphia Parks and Recreation, Philadelphia Water Department, and the School District of Philadelphia. 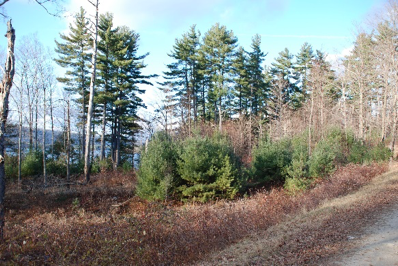 In Connecticut, creative partnerships include working with surface water suppliers who manage thousands of forested acres and forestry professionals. These Connecticut partners face unique challenges associated with timber harvests, invasive species, and wildlife management. EPA staff Kira Jacobs and Trish Garrigan meet with Andy Hubbard, forester for the Hartford, CT water supply, the Metropolitan District Commission. It was a pre-site tour for a field trip that was held as part of the Healthy Forests = Healthy Waters conference in Hartford, CT, hosted by the American Water Resources Association. For more information about source water protection efforts in Connecticut, visit the CT Source Water Collaborative website. Learn more about source water protection and forestry here. Working with land trusts and land conservation organizations is a creative way to do outreach and education on source water protection. Here, paddlers gather to discuss source water protection prior to the annual Memorial Day Paddle, hosted by the Moose Mountains Regional Greenways, a land conservation organization in New Hampshire. Land trusts provide education as well as recreation opportunities that build support for their mission. 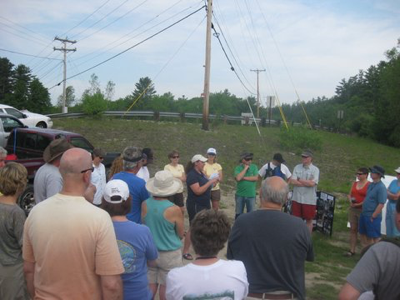 As local residents paddled on a tributary to the Salmon Falls River in Milton, New Hampshire, they witnessed firsthand the importance of conserving land that protects their drinking water supply. For more information, visit the Salmon Falls Watershed Collaborative. Land trust members and local residents take a midday break to learn about their local environment and socialize in a relaxed setting. Creative partnerships are best established by working in person and learning from each other firsthand. This photo of a detention pond-- adjacent to Interstate 95 and upstream of a water supply-- was taken as part of an EPA-funded source water protection workshop in Maine with the Department of Transportation team and water suppliers. The group visited sites in the watershed focused on unique challenges facing water supplies. A tanker spill from the Interstate could contribute contamination to the nearby water supply, so Maine DOT, Maine Drinking Water Program (DWP), and the water utility worked together to build a protective detention pond. From left: Andy Tolman Maine DWP; John Peckenham, University of Maine; Kira Jacobs, EPA Source Water Program; Bill Snyder, KKW Water District; and a representative of Maine DOT. For more information,visit Maine DEH. Hear experiences from well-established and newly forming collaboratives. The Schuylkill Action Network (SAN) is a collaborative network of over 100 partners working to improve the water resources of the Schuylkill River. SAN seeks to achieve its mission through enhanced communication and collaboration. Over 150 organizations (over 500 people) are involved in its workgroups. Public outreach is not only key to their mission, it helps foster new connections and new partnerships. The Schuylkill River Heritage Area, a key SAN partner, hosts the Schuylkill River Sojourn, an annual 112-mile guided kayak trip on the Schuylkill River that begins in rural Schuylkill Haven and ends seven days later in Philadelphia's Boathouse Row. The first place design for the 2016 Schuylkill Street Art Contest. The yearly contest is open to students, grades 6-12. Drain art helps educate people about the connection between storm drains and streams. Winning design of the 2014 Schuylkill Students Street Art Contest. Bence Veres had his design installed at City Park in Reading, PA.
Students from the Envirothon and Environmental Awareness Club worked with the Green Valleys Watershed Association to install a 860 sq ft bioswale on campus. The students received the SAN Scholastic Drinking Water Award, given annually to three schools in the Schuylkill Watershed that help protect sources of drinking water. The 1st, 2nd, and 3rd place winners of the reoccurring Schuylkill River photo contest. During the Industrial revolution the river was heavily polluted. Now the Schuylkill provides drinking water for over 1.5 million people. A week-long service-learning program offered to a team of high school students from the Schuylkill River Watershed. The Schuylkill Headwaters Association leads students on guided tours, programming, and applied service work designed to highlight issues in the watershed and explore hands-on solutions to these problems. Students assist with the removal of Rusty Crayfish, an invasive species in the Valley Forge National Historic Park. Formed in 2010, the Salmon Falls Watershed Collaborative brought together over 82 partners to tackle the issues plaguing the watershed that led to it being identified as one of the most threatened watersheds in the U.S. This video features many of the partners that have been key to the forming and continued success. Visit this website for more information about this collaborative. Download a resource document with quick links and descriptions of various government and private grants. Learn how Clackamas River Water Providers combines membership dues and grants to fund projects and research. Communities across the country are working together to eliminate nutrient pollution in their sources of drinking water. Click on the interactive story map below to learn more about the causes and sources of nutrient pollution and to browse projects to reduce nutrients in your area. Provide us with your email address and we'll notify you based on your preferences.